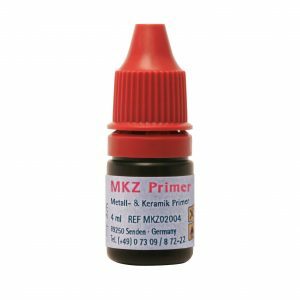 MKZ Primer is used for superior bonding of composites to precious alloys, used in dentistry. It is perfectly suited for bonding individual abutments. MKZ Primer is designed for the adhesive bond of composite to metal frameworks. MKZ Primer is used for conditioning all NPM alloys and titanium, zirconium dioxide, aluminium oxide and spinel ceramic. This is how chemical bonding to composites such as crea.lign is achieved. Accordingly, MKZ Primer is perfectly suited for luting individual abutments. MKZ Primer may be used intraorally. 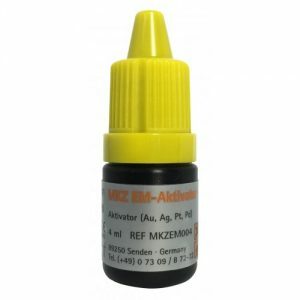 MKZ EM-Aktivator is designed for the adhesive bond of composite to precious metal frameworks. MKZ EM-Aktivator may only be used in combination with MKZ Primer, in a mixing ratio of 1:1 to condition precious metal frameworks (Au, Ag, Pt, Pd) and for chemical bonding to composites such as crea.lign. MKZ EM-Aktivator may also be used intraorally.